Your morning cup of coffee from McDonald’s is made of polystyrene—a synthetic and inexpensive polymer made from liquid petrochemicals. Similar to Styrofoam, this once-thought-of-as-disposable product is one of the most common forms of litter on beaches. It breaks but does not biodegrade. Therefore, it gets caught in storm drains and gets mistaken as food by small animals and aquatic birds. Furthermore, the International Agency for Research on Cancer determined that styrene is a possible human carcinogen suggesting an increased risk of leukemia and lymphoma. In 2009, the California Office of Environmental Health Hazard Assessment proposed that it be listed as such, and 46 cities and counties in that state have henceforth banned the use of polystyrene in food packaging. So, at long last, and in the face of such evidence, the McDonald’s Corporation surrenders. The world’s largest fast food franchise announced that all 14,000 of the company’s dining establishments will replace their polystyrene foam hot beverage cups with paper-based cups. Apparently, this development comes only after a pilot program beginning in March 2012 which saw a trial version of the paper cup makeover at 2,000 U.S. locations. 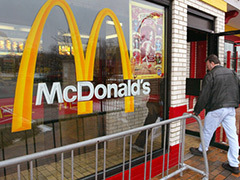 McDonald’s tested double-walled fiber hot cups at 15 percent of stores, and As You Sow backed off. Now, the company has confirmed that the pilot program was indeed successful and that it will completely phase out foam cups in the coming months. The paper cups require more energy and chemicals to produce and will cost the fast-food chain a bundle more. But, at least they biodegrade. So, why did it take three years for McDonald’s to only implement a portion of As You Sow’s comprehensive packaging recycling policy? Why is this being lauded as a breakthrough? As As You Sow knows, Starbucks has used 10 percent recycled paper fiber in its paper hot beverage cups for years, and has committed to recycle all post-consumer paper and plastic cups discarded in company-owned stores by 2015. The juggernaut coffee chain also offers a discount for customers who bring reusable beverage containers into stores. Again, why is McDonald’s so far behind … especially with non-profits hot on their trail? It’s not good enough that they’re one of the largest purchasers of recycled paper, bags and napkins. As the sign says, they serve billions (hamburgers, that is), and they’ve been around for several decades more than Starbucks as well. The Environmental Defense Fund tried to urge McDonald’s to phase out polystyrene foam-based clamshell food containers almost 20 years ago to no avail.But, As You Sow must tow the line, and paint this small (and very late) victory as a giant one. “We would like McDonald’s to match Starbucks leadership in moving towards more environmentally responsible cups by developing recycling systems for post-consumer in-house beverage containers and using high levels of recycled content,” said MacKerron. Posted on October 2nd under Pollution Reduction.